That IS amazing. Thanks for the update and the picture. Wonder where he is during the daylight hours. It's about 2 AM there isn't it Teresa? Those two should be snoozin' away in their nests. For that matter, so should you! It was 3 am! Those two are fast asleep now, they come round just after 9 pm, between dusk and dark. And my brain faculties are going into meltdown, so I'm going to follow their example. I just hope I'm not going to dream about Balantidium coli like last night! 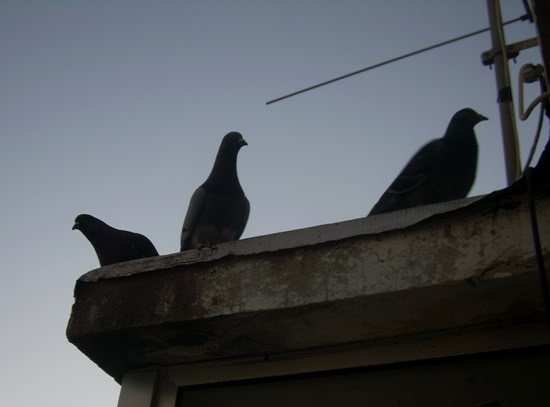 Even though Nightflier has gone to bed now, I've seen the pigeons at the back of my house take to the air after 2 am before, when they are startled -- mostly by cats or sudden noises, but once by a pair of thieves on the roof. I shone a powerful torch on them and they fled empty-handed. So when people criticise me for feeding them, I tell them they're my guard dogs! Nightflier started coming round again after dark with his mate, a petite blue-bar, and a younger male that looks just like him. I'm presuming it's his son. They'd stopped coming round after dark at the end of summer, and restarted about a week ago. (I have no idea why). It's hilarious the way he calls my attention: at that time, the windows are already closed because of the cold, so he lands on the windowsill and actually pecks at the glass or wingslaps it until I go get him some food! I'll have to capture that on camera! In the middle of a tiring and stressful week, he's been one of the high points, definitely! I can see why. Sounds cute. I hope you can get a picture of it. Nightflier sounds like a little darling, Teresa. Isn't it wonderful how the smallest things can be the biggest joy for us, especially when stressed. [quote="AZWhitefeather"]Nightflier sounds like a little darling, Teresa. Well, today I got the camera, but by then he KNEW I'd seen him, so no pecking at the window... Typical, eh! But I managed to get a couple of photos of Mr. and Mrs. Nightflier and son. [b]Isn't it wonderful how the smallest things can be the biggest joy for us, especially when stressed. I haven't got a video of Nightflier knocking at the window, but I got this photo.